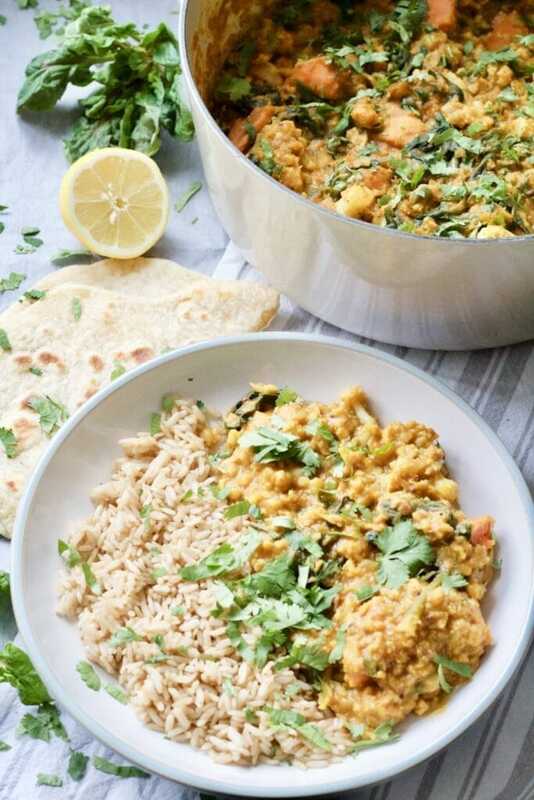 This Easy Cauliflower & Lentil Curry is the perfect meat-free, midweek family feast. Delicious, filling & fuss-free it is packed with veggie goodness. We are huge fans of curries here! Even the kids are willing to devour dishes with a bit more heat to what they used to, although I don’t think we will go full throttle with the chillies any time soon! 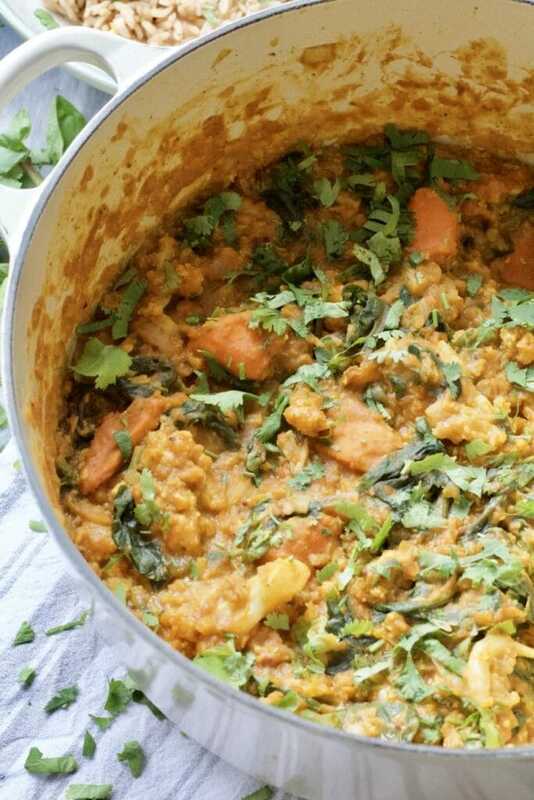 This lovely cauliflower and red lentils based veggie curry (dhal) is an example of milder fare which will suit all the palates. Having said that, if you like some heat I’ve got few tips on how you can adjust it without much hassle, just read on! Why is this curry so wonderful? Ready in just 40 minutes from start to finish meaning you don’t need to wait for the weekend and more time on your hands to be able to enjoy it. It’s the perfect midweek family dinner (as per above)! Perfect Meat-Free Monday dinner if you’re trying to limit your meat intake a bit. Fragrant and full of flavour yet on the mild side so that your entire family can enjoy it. Easily adaptable as per your spice tolerance! 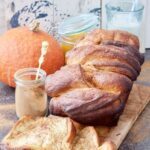 Super wholesome and packed full of veg! It’s really, really delicious! Proper comfort food! 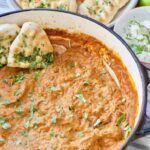 I’m not a fan of mild curries, how can I make it more spicy? I totally get it. Since having children I was forced to curb my enthusiasm when adding chillies to my favourite spicy dishes which hasn’t been easy! I have learnt to enjoy the fragrance and flavour more these days but I have also learnt few tricks to adjust dishes to my taste if I indeed fancy something more spicy. I do swear by chilli infused olive oil (this is the one* I use and love). A little drizzle over the plated portion and I’m in business! Although it might not be very authentic, it is, however, an effective way of getting some spice. Alternatively, you can sprinkle your portion with some dried chilli flakes or some cayenne pepper will work too. 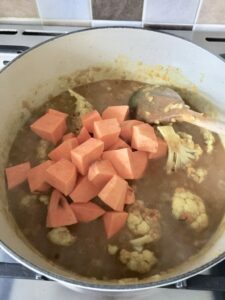 If you, however, are not making this curry with children in mind you can simply use hotter curry paste (rather than korma I’ve used here) and/or add a chopped red chilli into the mix and add it at the same time as curry paste and other spices. Whether you leave the seeds in or out is entirely up to you! The cooked curry has got consistency of a dahl (lentil based curry) which makes sense considering there is a substantial amount of lentils here. 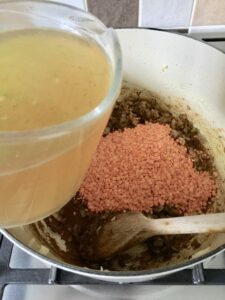 The great thing about dried lentils as opposed to other dried beans and pulses is that they cook very quickly and there is no need to pre-soak them. Simply add them as they are and they will cook in no time. 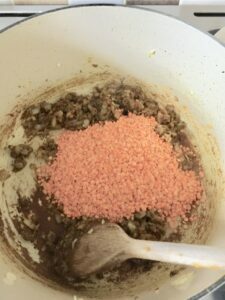 Some people tend to rinse lentils briefly before adding to dishes but personally, I haven’t noticed any difference in the texture or cooking time so I usually don’t bother. This curry is perfect for batch cooking and freezing too. 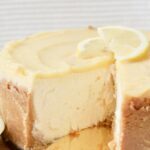 Simply pop it in the freezer proof containers or bags and freeze for up to three months. 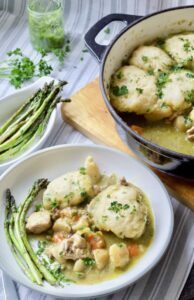 Defrost in the fridge overnight or if you find yourself in a last minute dinner panic (I’ve been there on more than one occasion) simply use microwave or decant it into the pot and defrost on low heat on the stovetop. This curry can be also prepared in advance and kept in the fridge for up to 4 days. 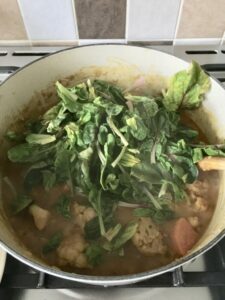 As with most curries, the flavours will intensify the longer they have a chance to develop. 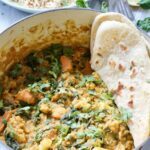 This veggie and lentil curry or dhal would be perfect as a part of an Indian food banquet but on this particular occasion I served it with some brown rice and my no yeast Easy Flatbreads. My Easy Indian Spiced Basmati Rice would make this feast even more special and my yeast-free Easy Naan Bread would be perfect for mopping your plate clean! 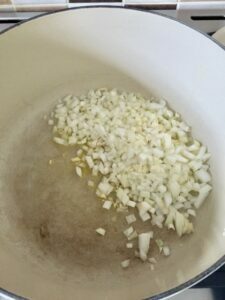 Saute onion and garlic in a bit of oil for 5-8 min. Add curry paste, tomato puree and all the spices and saute for couple more minutes. Pour in coconut milk and stir well to help the solids dissolve into the sauce. Add prepared cauliflower florets, mix well and simmer for about 10 min. It’s time to add sweet potatoes and simmer until both potatoes and cauliflower are tender 5-10 min. Add couple of handfuls of fresh spinach and stir it in. Take the curry off the heat, taste and season with salt and pepper. Add some lemon juice and chopped coriander/cilantro. 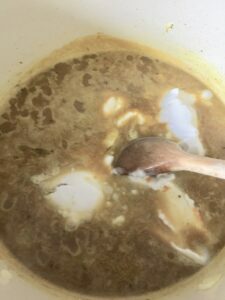 Heat up the oil in a large pot with a lid, add chopped onion and garlic and fry for 5-8 minutes until softened and translucent but not coloured. Add curry paste, tomato puree and all the spices and fry them with onions for a couple of minutes. At this point your kitchen will start to smell amazing! Add lentils followed quickly by veggie stock and coconut milk. Keep stirring and prodding until the solid part of the coconut milk melts into the liquid. Add cauliflower florets and make sure they are immersed in the liquid. Bring curry to boil, cover (at which point you lower the heat) and simmer for about 10 min stirring from time to time. After 10 minutes add cubed sweet potato making sure it is immersed in the liquid. 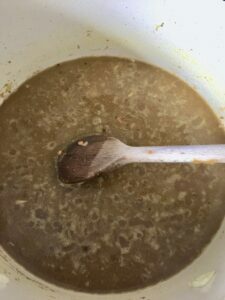 You might need to add a splash of water or stock if mixture is getting a bit dry. Simmer for another 5-10 minutes until both cauliflower and sweet potato are tender. Add two handfuls of fresh spinach leaves and mix it in. Take curry off the heat, taste and season well with salt and pepper. Add the juice of one lemon (or to taste) and mix in chopped coriander/cilantro stalks and leaves (leaving some leaves as garnish). 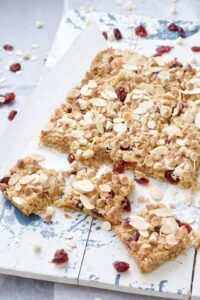 Serve with rice and/or flat breads of your choice. Nutritional information is approximate and should be treated as a guideline only. I used mild korma curry paste here but you could use your favourite curry paste instead. 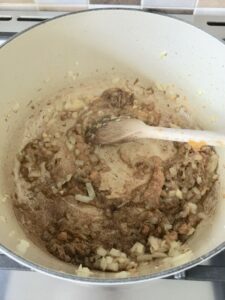 If you fancy some extra heat, feel free to use small chopped chilli (without or with seeds if you're brave) and add it as you are adding curry paste and spices. You can use frozen spinach instead of fresh. Cook it as per packaging instructions and stir it in at the very end. Tried this recipe?Tag me @Joskitchenlarder or use hashtag #joskitchenlarder! 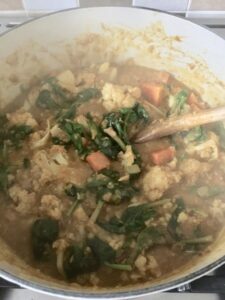 PIN EASY CAULIFLOWER & LENTIL CURRY FOR LATER! *This post contains affiliate links, which means that if you click on a link and go on to buy the product I recommend, I will get a small commission, but you will not be charged a penny more. I only recommend products I own or really like and which caught my attention. 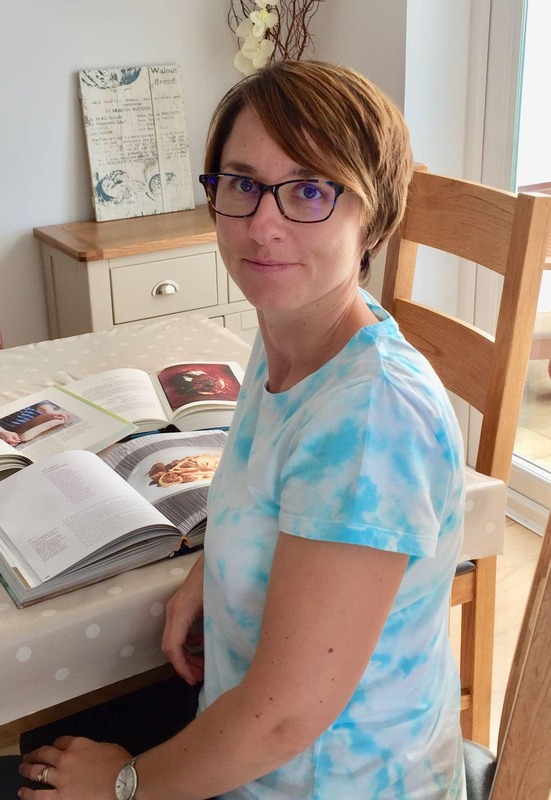 Thanks in advance for supporting Jo’s Kitchen Larder! 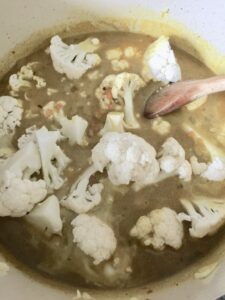 How bizarre, I’ve just commented on another recipe using cauliflower that I was looking for more ideas of what to do with the veg and now I’ve seen two recipes in the space of ten minutes! It’s a sign, going to give this curry a go for sure. This looks amazing! We love curry in this house & I will definitely be adding this to our round the world wednesday nights! Thank you so much Midge! So glad to hear that! 🙂 I hope you love this one as much as we do! What a glorious curry, I must add it to my list to make. Thank you Janice! 🙂 I’m glad you like it! This looks gorgeous. 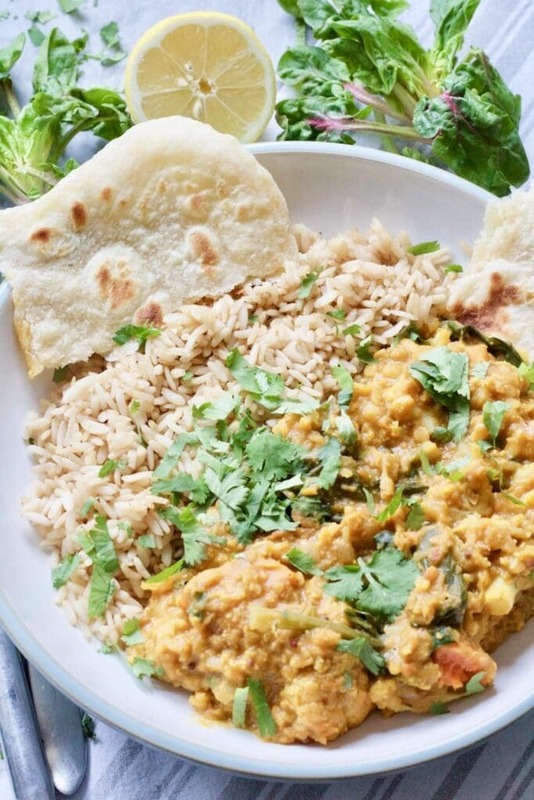 I love a quick curry as a midweek meal – it’s like a promise of the weekend. And I love curries with garam masala in them. 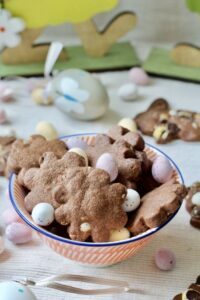 It often gets overlooked but I think it always takes them to the next level – delicious! Thank you Anna! 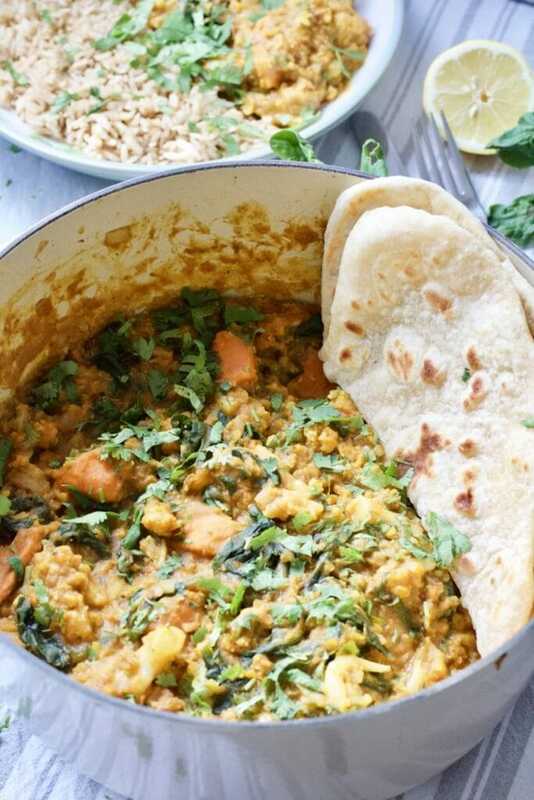 🙂 Nice curry definitely makes a midweek meal that bit more special and if it’s quick and easy to put together that’s an added bonus! I share your love for garam masala, it’s a beautiful and versatile spice I add to most of my curries. This curry has so many wonderful flavours! And it’s healthy too! pinned! It sounds really delicious! 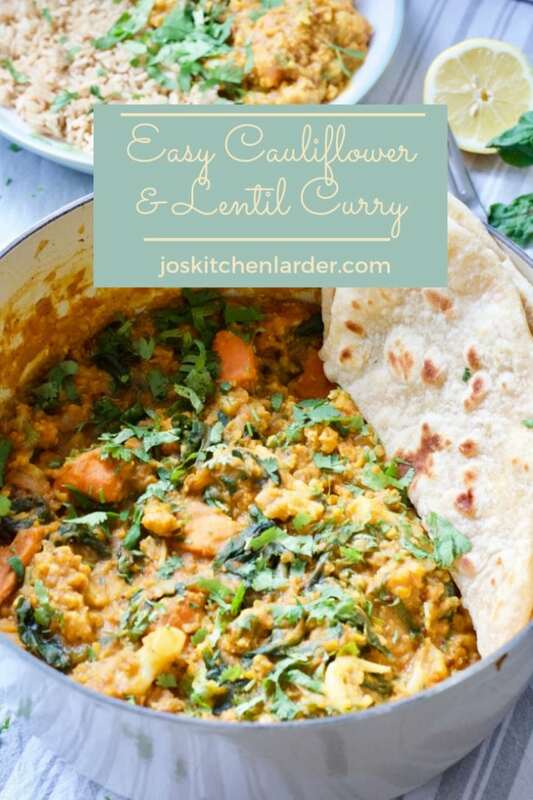 I would definitely love this although my children are not huge fans of cauliflower and lentils so it might be one for me to try a bit later on them! Thanks for sharing with #CookOnceEatTwice as well Jo! Since leaving my last comment I have manage to get Master Spice to eat some lentils in a soup along with lots of other ingredients so maybe it won’t be too long before this would work on him!